The British navy was the largest in the world at the start of the First World War, but even so it could not break through the defences set up by the Ottoman Turks in the Dardanelles Strait. What went wrong? How could they have succeeded? This section looks at the naval campaign at Gallipoli: the attacks in March 1915 and the part played by submarines. Here, naval historian Michael Forrest tells us why it was so hard for the navy to break through the Turkish defences and considers whether they could ever have been able to succeed. These two diagrams show the difficulties for the allied navy – the design of the shore forts and the minefield. For a more detailed map of the minefield click here. 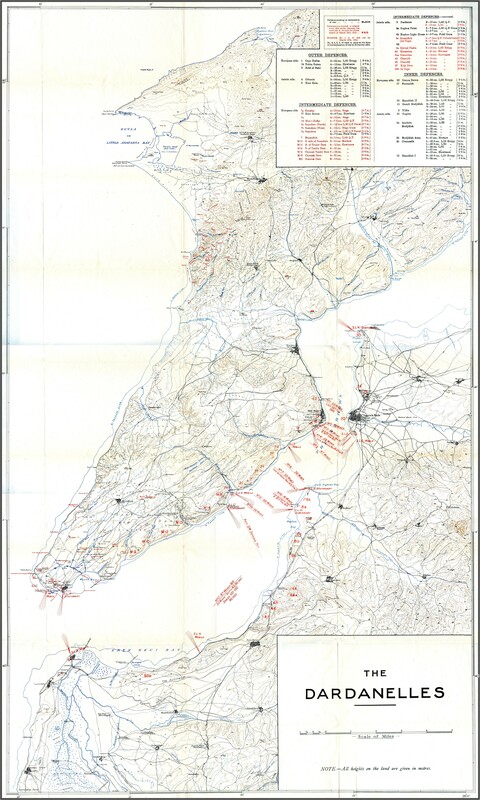 However, having failed to break through the Dardanelles Strait, one major mistake was to leave over a month before starting the land campaign. This gave the Ottoman Turks time to strengthen their land defences and bring more troops and ammunition to the area. In the words of the German General Otto Liman von Sanders, who commanded the Turkish army, “The British gave me four full weeks warning before the landings. That was just sufficient to complete the arrangements”. For the rest of the Gallipoli Campaign, the navy provided bombardment of the Turkish lines, brought in troops and supplies and eventually evacuated the army. Many sailors also went ashore to fight in a special section called the Royal Naval Division. You can follow one RND soldier’s story here, and we also feature the creative work of other RND soldiers in our section on poetry (Rupert Brooke) and music (William Denis Browne). In the National Museum of the Royal Navy in Portsmouth, the only surviving ship from the Gallipoli Campaign, H.M.S. M33, has been restored. As part of the restoration project, there have been many educational activities with local schools and the community, including a film called M33: Destination Dardanelles,written and directed by young people in Portsmouth. See HMS M33 Voices from the Front for more details.